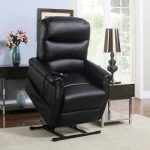 How easy would it be to use a recliner that doesn't require manual lifting? It would mean that your grandma or grandpa won’t have to worry about pulling their arm out or not having enough strength – as odd as that sounds. This also isn't to say that swivel or rocker recliners are worse either, they are actually apart of the best recliners today. But, for those who want an easy to use chair, especially when there are medical issues present, a power lift recliner is the best option. That is why in this article, we will be looking at the best power lift recliners and everything and anything to do with lift chairs. 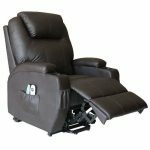 The primary benefit (and difference) between a power lift recliner and a manual recliner is that you just press a button and you’re able to recline with ease. You don’t have to worry about being tall enough to pull the lever, or strong enough, and you reduce the risk of injury. It’s no secret that many people who use recliners often have medical issues, and power lift recliners make a lot safer and convenient. Beyond this, there are added bonuses of using a recliner daily, and some of these include the ability to encourage proper blood circulation as you elevate your feet. In doing so, you can reduce the risk of other ailments. While using a recliner, those with edema in their ankles, knees, or legs can see a reduction, as they aren’t sitting with their legs down to encourage fluid puddling. This may not sound pleasant, but it's a very real reality that many people face – and exactly why doctors encourage the elevation of feet and legs. With easy assembly for a great price, this leather lounge comes in black and brown. It features one motor that reclines upwards of 135 degrees total. 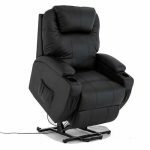 The back and the footrest of this motorized recliner work together to provide a cohesive and comfortable experience. The architecture of this chair features a wooden frame that’s solid, comfortable, with extra padding underneath the leather. There are also massaging features that relax the knots and aches in your body. For the price, you really can’t beat the fact that it’s composed of leather and that it has massage features. One bonus we love is that you’re able to enjoy power reclining from a price range that doesn’t feature motorized options. Lastly, customers have praised this recliner for nursery usage, width, and height, as it can adjust for people tall as 6'3. There aren’t too many disadvantages, as the features and design are standard. However, if you’re anti-leather or the feeling of leather, you may not want this chair, as there’s no getting around the upholstery. Equipped with a 5-year mechanism warranty and a powerful motor, you're going to love the texture and feel of this Chenille chair. 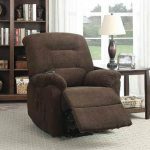 Both the lift and the recline are powered, and you won't have to deal with the struggles of a weak power recliner. One of our favorite features (besides the motorized aspect), is the Chenille. The charcoal color is able to blend seamlessly with any home decor, although other colors are offered for those who want to make a statement with their furniture (red, brown, and white). Another one of our favorites is that it comes with a mechanism warranty that doesn't expire for 5-years. If you are afraid to take the plunge, you can feel at ease with this warranty! If you want something fancier then you are going to have to look elsewhere. Overall, the chair uses basic functions and doesn't have any massage features. Although, the price reflects that, those who want to spend the bare minimum will enjoy the basic comfort that this chair provides. 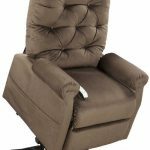 Manufactured by Mega Motion, this simplistic tufted power lift recliner is not only extremely comfortable, but great for those with back issues. Lift capacity is 330 lbs. Featuring a 330 lbs. maximum lift capacity, almost anyone will be able to comfortably use this chair. That is the key, comfort. When testing this chair, we found that even though we got closer and closer to the maximum weight capacity, the comfort remained steady. With three different positions, that all use the electric motor, you're going to feel surprised and luxurious using an advanced chair that is this smooth. Although the price is higher than some of the other chairs on our list, you can ease your mind with the abundance of warranties that are included. There is a one year warranty for in-home servicing, 2-year warranty for parts, and a LIFETIME warranty on the lifting mechanism – that is hard to pass up. Furthermore, the recliners cushions, for your convenience, are zipped, allowing for easy replacement and adjustment. Overall the complete comfort feeling is definitely felt in the quality of the lift and recline. We can’t say that there are too many disadvantages, but if you’re on a tight budget and are scared of splurging, just know that the warranties allow you to get it fixed if something were to happen – you’re covered! Relaxing and reclining to watch television quietly while everyone else is asleep is something we all do. With the Divano Roma recliner, you’re going to be able to do so with ease, as it comes equipped with a silent, German-made motor. Designed for extended recline and upholstered durably with bonded leather, ​you don’t have to worry about the material breaking or ripping apart. A chair isn’t truly a chair without being comfortable, is it? Although comfort can come with multiple features, we can all agree that an ultra-plush chair is something we don't want to give up. Composed of bonded leather and being ultra-plush, you don’t have to worry about the Divano recliner feeling like wood or being too stiff for your liking. Lastly, it does not compromise on aesthetics for performance. Many chairs on the market today get the job done, but do not provide the contemporary/modern appeal that this power lift power house does. This recliner is minimalistic and not all folks like that. Although, we definitely think this chair has a place in many homes. Last on our list is a wall hugger that has a ton of features, check them out below. With the ability to focus on 4 areas of your body with 8 different massage points, you’re able to relieve and relax your thighs, legs, thoracic and lumbar regions with no issues. More importantly, the integrated power lift mechanism is why you’re here! There are vibrating and heating features for those who want to get extra cozy and have an affordable alternative to a massage chair. The various luxury features were enough to sell it to us. With vibration / massage modes, along with heating capabilities on top of the power lift reclining, and speed intensity control, you definitely get everything you want. The price is reflective of the amount of features you receive. A lot of folks may not want to spend this much and that is very reasonable. It should be noted though that this chair does have massage capabilities which is the main reason the price is higher than others on our list. Before you jump in, you should know certain factors beforehand, so you’re prepared for having a recliner in your home. One of the more obvious factors you should consider is your space. Are you able to recline comfortably (regarding space, not actual comfortability)? This means that you have enough space between pieces of furniture, as well as enough space to recline away from the wall. For small spaces, you won’t be able to recline comfortably, and there will be much less room for others to navigate around. Another factor to consider is your budget. It’s always worth mentioning that the value of a chair shouldn’t be placed on the monetary aspect, as there are plenty of affordable options that perform incredibly. The layout of your furniture may have to change in order to welcome a new piece into your home. This will help you visualize what your home will look like after you add your new recliner. Next, you should determine the advancement of the recliner and practicality for the customer. Power lift recliners are generally used by the elderly and many of these chairs come with advance features. The features cause the price to increase but are not always used by the customer. It is important that you make sure the recliner you purchase is compatible with the person who will be using it. This will save you money and time. Furniture shopping can be both frustrating and fun - depending on who you are! If you're still undecided, you should check out our editor's pick, the Divano Plush Recliner. Attractive in appearance and in price, you'll be getting everything you need.